Runners (and walkers) — Register NOW for the MCStrong 5K Classic on April 23, 2016! Click on logo above to register for the 2016 MCstrong 5K Online! or click here to print registration form and mail to The Michael Collins Foundation PO Box 19 Hudson Il 61748. It’s official! 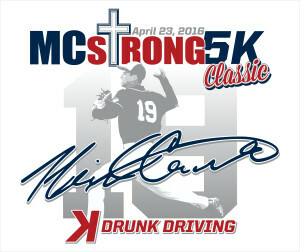 Registration is now open for the MCstrong 5K Classic Run/Walk! This year we are having CHIP TIMING, and adjusting the route to make improvements for our runners and walkers! We would like to thank the over 1,300 runners and walkers that helped make the event a HUGE success last year, and look forward to having all of you back and more!